I was trying to test out the new beacon in my nether fortress and i encountered some issues. 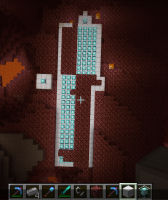 2: the beacon will never emit light beams in the nether. MC-67727 Beacons in Nether need clear path to "sky"